Quality Steelpans and Accessories from Trinidad and Tobago. Call it what you like, steel pan, pan, steel pans, steel drum, tenor pan, steel pan drum, Caribbean steel drums, Trinidad and Tobago steel drum and collectively with musicians as a steelband. It's still infectious with its beautiful tone, and truly identified as the only instrument invented in the Caribbean. Started in January 2004 by European based Trinidadians. SteelPan International offers a new and unique concept in the world of Steelpan Retail. 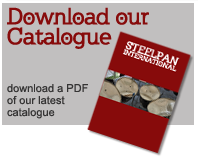 SteelPan International specialise in the global manufacturing and shipping of hand crafted Steelpans and all Pan related accessories. Our Steelpan makers have been in the industry for the past 50 years. They were instrumental in the creation of several Steelpan orchestras and remain the only Steelpan company to sponsor a Steelband in Trinidad & Tobago, and continue to work to promote Steelpan music.